This figer ruler is used to measure the length of endo instruments, come and have a look now! Made from high quality plastic, not easy to deform. Clear scale and accurate measurement. 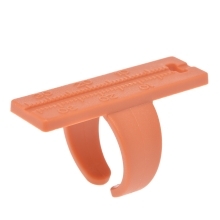 Can wear on finger, convenient to use. For measuring dental endo instruments.